Comes in a package of 20 charms. These charms measure 21x8mm. 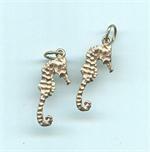 These charms are silver plated over a base metal mix. These findings measure 6mm long by 10mm wide by 3mm thick. The loop measures 4mm long and 2mm in diameter. These findings are made of solid brass and were made in Indonesia. Some of these charms have oxidized and patinaed a little. 12mm, 1 These findings measure 12mm long by 12mm wide by 1mm thick. The loop measure 5mm. These findings are made of solid brass and were made in Indonesia. There are 14 of these solid brass findings in a package. These findings measure 13mm long by 13.5mm wide. The loop measures 2mm. The small loops measure 1mm. These findings have many loops on the bottom to hang crystals or chain from for a dazzling pendant or pair of earrings. These findings measure 15mm long by 10mm wide by 4mm thick. The loop measures 2mm. These findings are made of solid brass and were made in Indonesia. Some of these charms have oxidized and patinaed a little. These findings measure 15mm long, including the loop, by 11mm wide by 5mm thick. The loop measures 2mm. These findings are made of an antique silver plated base metal alloy. There are 20 of these findings in a package. These findings measure 16mm long,including the loop, by 13mm wide by 1mm thick and the loop measures 2mm. These findings are made of solid copper and were made in Indonesia. There are 10 of these solid copper findings in a package. These findings measure 16mm long, including the loop, by 11mm wide by 2mm thick. The hole measures 1.5mm. These findings are made of solid copper and were made in Indonesia. There are 6 of these findings in a package. These findings measure 17mm long, including the loop, by 10mm wide by 1mm thick and the loop measures 5x3mm. These findings are made of solid copper and were made in Indonesia. There are 12 of these solid copper findings in a package. These findings measure 17mm long by 11mm wide. The loop measures 2mm. These findings have a small stick to glue beads onto for a dazzling pendant or pair of earrings. These findings are made of antique silver plated brass. These findings measure 17mm long by 8mm wide by 1.5mm thick and the loop measure 2mm. These findings were made in Indonesia. These findings are NOT bendable. These findings measure 19mm long by 13mm wide by 1mm thick. The loop measures .5mm. 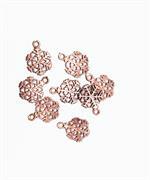 These findings are made of a copper/rose gold plated zinc based metal alloy. There are 6 of these findings in a package. These findings measure 22mm long, including the loop, by 15mm wide by 2mm thick. The loop measures 2mm. 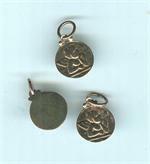 These findings are made of an antique silver plated lead and nickel safe copper. There are 2 of these findings in a package. These findings measure 23mm long by 16mm wide by 2mm thick. The loop measures 1mm. These findings are made of an antique brass plated based alloy. There are 6 of these findings in a package. These findings measure 26mm long, including the loop, by 12mm wide by 2mm thick. The loop measures 1.5mm. These findings are made of an antique brass plated base metal alloy. There are 30 of these findings in a package. These findings measure 27mm long by 13mm wide by 12mm thick. The loop measures 3x2mm. These findings are made of an antique silver plated lead and nickel safe zinc based alloy. There are 2 of these findings in a package. These findings measure 40mm long by 17mm wide by 3.5mm thick. The loop measures 1.7mm. These findings are made of an antique brass plated zinc based alloy. There are 4 of these findings in a package. These findings measure 41mm long by 36mm wide by 2mm thick and the hole measures 2.9mm in diameter. The cabochon setting measures 20mm in diameter. These findings are made of an antique brass plated lead and nickel safe base metal alloy. These findings measure 50mm long, including the loop, by 31mm wide by 1mm thick. The loop measures 2mm. These findings are made of an antique copper plated lead and nickel safe iron base metal alloy. There are 20 of these findings in a package. These pendants measure 25.5mm long by 26mm wide by 7mm thick and the loop measures 2mm in diameter. These pendants measure 29mm long by 29mm wide by 7.5mm thick and the loop measures 2mm in diameter. Comes in a package of 12 charms. 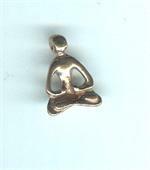 These yoga charms measure 20x14mm. These charms are an assortment of mixed metals including silver plated, gold plated, antique copper plated, antique brass plated, copper plated and gun metal plated over base metal. Comes in a package of 10 charms. These charms measure 28x15mm. Comes in a package of 20 findings. These findings measure 42x14mm. Comes in a package of 30 findings. These findings measure 19x12mm. Comes in a package of 20 findings. These findings measure 20x14mm. Comes in a package of 24 findings. These findings measure 24x21mm. Comes in a package of 40 findings. These findings measure 12x15mm. Comes in a package of 30 pendants. These findings measure 44mm long by 50mm wide and the loop measures 4mm. These findings are made of an antique silver plated base metal alloy. Comes in a package of 40 findings. These findings measure 31x9mm. These charms measure 16.5mm long by 11mm wide by 11mm thick and the hole measures 1.5mm in diameter. Comes in a package of 20 findings. These findings measure 20x23mm. Comes in a package of 20 charms. 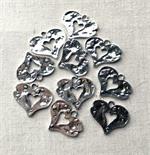 These charms measure 25x23mm. Comes in a package of 100 findings. These findings measure 13x9mm. These charms measure 17mm long by 16mm wide by 3mm thick and the loop measures 1mm in diameter. Comes in a package of 50 findings. These findings measure 14x12mm. Comes in a package of 100 findings. These findings measure 15x6mm. Comes in a package of 75 findings. These findings measure 17x5mm.